Cumberland, a small, historic city in western Maryland’s Allegany County, is not without its challenges. Like other former manufacturing-based cities, times are tough for many of its residents. 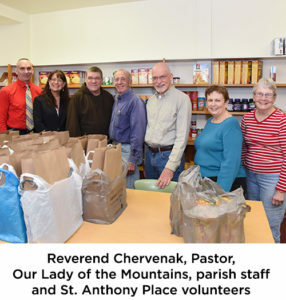 Through its outreach center, St. Anthony Place, Our Lady of the Mountains Parish is doing its part to help those in need. Assisting families with food and cleaning supplies, St. Anthony Place offers assistance with rent and utilities costs too. Parishioners of Our Lady of the Mountains, John and Roslyn Balch, have always held a special place in their hearts for St. Anthony Place. For years, they had made annual contributions. Recently, they augmented their support by establishing The BalchFamily Endowment Fund for St. Anthony Place in the Catholic Community Foundation.